One for the diaries in May is STREET FEST, a new breed of festival where the onus is on promoting and merging creative talents. STREETFEST is taking it back to the 'old skool', blending the spirit and soul of those nostalgic rocking block parties, with creative flair and modern trends. STREETFEST actively involves visitors in the day's events by creating an interactive experience! 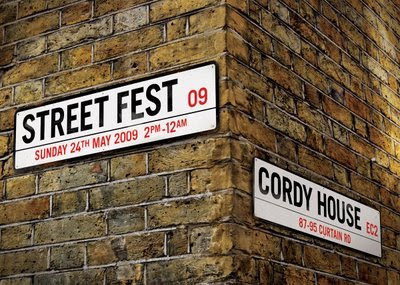 STREETFEST will be held in the pioneering surroundings of Cordy House, Shoreditch. With ten hours of innovative showcases- featuring music, live art, films, hair and fashion shows plus fixed gear biking, rollerblade and skateboard demonstrations, all from some of the UK's top collectives, this is not an event to miss! Key participants in STREETFEST include Lovenskate - spreading the word of skateboard culture, Kingdom- offering a British perspective on rollerblading eccentricity and Fixed Gear London- showcasing bicycle culture. The art focus comes from Secret Wars delivering timed live art battles and a collection of fine and street artists including Andy Seize, Sichi and Drunkpark will be painting throughout the day. Holic and Rhil are the powerhouse promoters behind the music programming during the day. Film contents come in the form of three innovative collectives-UK Adapta, Stomper and Hekate Films, with additional skate and biking films being shown. Stalls promoting international food, emerging clothing brands, books, prints, art toys and collectables will also be participating on the day. Each space will have its own identity and feel, so be prepared to enter the quirky and wonderful world that is STREETFEST.